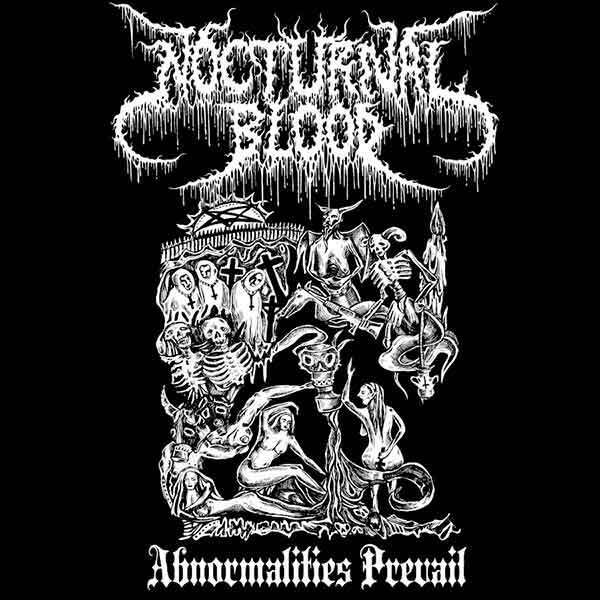 A compilation of NOCTURNAL BLOOD's debut demo as well as myriad EP and split releases, Abnormalities Prevail displays this one-man entity's "uncompromising evolution" across its staggering 20 tracks. NOCTURNAL BLOOD began in 2008 as a solo-project for The Ghastly Apparition, who was slaying the metal underground as a teenager with holocaustic speed-merchants Nuclear Desecration. But upon the first recordings that would become NOCTURNAL BLOOD, the restless 'n' wild Apparition soon shifted his focus solely to NOCTURNAL BLOOD and put Nuclear Desecration to rest after three years of intense, incredibly prolific activity. Back then, "bestial metal" had yet to become a trend and subsequent forum-troll byword, and The Ghastly Apparition was far ahead of the curve with a molten, miasmic sound that pulsed upon the same foundation built by Beherit, Demoncy, and Blasphemy. Overwhelming in its singular obsession with ritualistic madness, the debut demo of True Spirit of Old... unveiled NOCTURNAL BLOOD to an underground that would soon be devoured by the bestial arts, and the interest and effect were immediate. Over the next couple years, The Ghastly Apparition churned out more of his churn, ever so subtly shifting the emphasis toward sinister atmosphere whilst never losing the chaotic death-rattle upon which NOCTURNAL BLOOD was formed. After this traditionally-underground legwork of demos, EPs, and splits, NOCTURNAL BLOOD unleashed its debut album, Devastated Graves - The Morbid Celebration, in 2010 via HELLS HEADBANGERS. Reaping international acclaim, Devastated Graves - The Morbid Celebration showed a more cavernous death metal side to NOCTURNAL BLOOD, which would then be further developed in The Ghastly Apparition's current band THE HAUNTING PRESENCE. Very much "of its time" while prefiguring those times all the same, Abnormalities Prevail is an essential compendium of a black-blood-vomiting darkness 'n' doom, and a hopeful sign for further aural atrocities from NOCTURNAL BLOOD.